Classic Horse Stalls is a product that Wick Buildings offers to you that gives you additional choices of high quality assurance when building your horse stall barn. Classic Stalls is a product that enhances the Wick Buildings product offering and we are pleased to offer this product to you. BIRDBLOX & BIRDBLOXplus have teamed up with Wick Buildings to offer you a superior product to keep birds from nesting in your building. Your local Wick Builder can demonstrate this very unique product to you have it installed in your new Wick Building or retrofit it to your existing buildings. With superior weather- tightness and a long, maintenance-free life, metal standing seam roofs are the fast-growing choice for both new construction and additions to existing buildings. No matter what type of structure your customers are considering, Wick standing seam designs give your customer the value and design flexibility that they are looking for. Standing seam roofs can be used in almost any situation, from commercial to residential, from small storage buildings to large manufacturing plants. Across the country, over 2 billion square feet of standing seam roofing is installed annually - and that figure grows each year. In fact, no roofing system lasts longer, requires less maintenance and offers such incredible versatility. Wick standing seam metal roofs are designed to ensure long-term durability and an attractive appearance. Made with exceptionally strong 28 gauge steel, Wick standing seam roof panels can handle all heavy snow loads required by the model building codes. Wick panels feature premium quality G-90 galvanizing and your choice of 25 year warrantied coatings that prevent corrosion and fading. 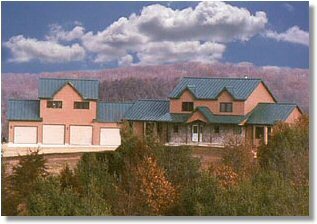 Standing seam roofs are engineered to withstand rain, wind, snow and sun. 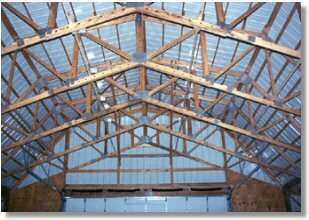 Each panel is joined together by a mechanically locked seam raised above the roof's drainage plane. Wick's spliceless standing seam panel design eliminates errors in panel installation and ensures that your roof will be leak-free for years to come. Properly installed, a standing seam metal roof will provide longevity with very little maintenance. This exceptional return on investment makes the standing seam design the most cost-effective choice for many customers. Wick Buildings' standing seam roofing system is as versatile as it is cost-effective. Ideal for use on new buildings as well as retrofit applications, standing seam profiles are available in various widths and heights to accommodate almost any project. In nearly all instances, Wick's steel panels are roll formed on site by a portable standing seam manufacturing system. Site-formed means less chance for panel damage during shipping and eliminates misfigured cut lengths causing project delays.